Clarice is thrilled. It's an Emergency and no one is available to babysit except her Uncle Ted, a very cool person. He promises things will be fine, but even with Mom's "Very Strict Instructions" things just don't work out as expected. 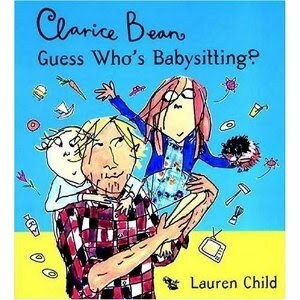 Which is fine with Clarice Bean! Lauren Child's collage illustrations and wacky text design mingle perfectly for a humorous story about family disasters and a missing guinea pig. Lauren Child perfectly captures the excitement and fun of Uncle Ted and Clarice's despair when she loses Albert the guinea pig. I've been asked to get more Clarice Bean books for our library (this is the only one we own) and I'm willing, except I'm confused as to which are picture books and which are chapter books. I'm not sure we need another realistic girl beginning chapter book series, since we already have tons of Ramona, Clementine, Judy Moody, Alice, Lucy Rose, and others. Verdict: I'm going to read the rest of the books in this series. If they're as funny and delightful as this one, then they're a definite must. Richard Kennedy's short stories, long out of print, are fascinating and timeless. They have a certain dream-like quality, as if you've just awoken from a dream that was beautiful and terrible, completely believable and utterly impossible, and it was gone in a moment from your mind. But when you read Richard Kennedy, you remember every moment. Originally published as picture books, several with Marcia Sewell's black and white sketches, most are more appropriate for older children and adults. 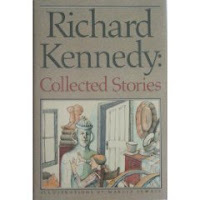 The collection includes brief mentions of Kennedy's inspiration for each story. Among the sixteen stories are several in particular that stand out. The Contests at Cowlick is the most light-hearted and has an almost folkloric feeling, complete with trickster. Many will be familiar with the picture book version illustrated by Marc Simont. The Dark Princess is a haunting story about love and beauty, showing a different perspective on the fairy tales of cold-hearted princesses who set impossible tasks for those who love them. Two of the longer stories include The Blue Stone, a be-careful-what-you-wish for story full of sly humor and comic comeuppance with a touch of magic. And then...Inside My Feet. This story is weird and frightening and beautiful and haunted and my favorite. A young boy living on an isolated farm with his parents is awakened one night by an odd knocking at the door and the puzzling silence of the dog. "Father would have said of Harley, 'probably sick.' Mother would be more inclined to suggest that he had been changed into a wheelbarrow or something." When they investigate, they find only a pair of giant boots. But later that night, noises begin again and when his father goes down to investigate, he disappears. The next night his mother disappears. The next night, the boy sets a trap and discovers the chilling secret of the boots: "Inside my bones/inside my meat/inside my heart/inside my FEET!". They are the messengers of a giant. With wit and courage, the young boy manages to escape the spell of the boots, find his parents, and answer the giant's question: "What became of the child that I was?". The boy frees his parents and destroys the giant and as he falls asleep the next night he wonders..."what was going to become of the child that I was." If you can find the picturebook version illustrated by Ronald Himler, do so. It's....completely different than anything else. 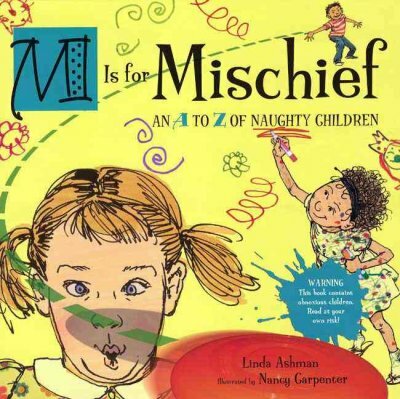 Verdict: I would love to see these reprinted, either in their picture book form or as a collection! 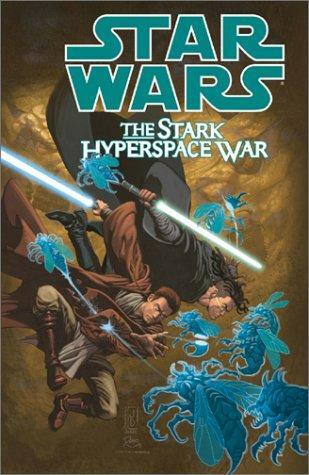 This comic is set before the Clone Wars and gives a short view of the Stark Hyperspace War through the eyes of the Jedi masters, telling the story to a young Jedi. I think I've read this one previously, so either I borrowed it from a library or it's included in one of the Star Wars omnibuses. Either way, it's a good addition to any Star Wars collection. Lots of action and familiar characters as well as introducing some minor actors. Plenty of humor and not too much tragedy, which is what I like in a Star Wars comic! This one could go either in juvenile or young adult, but since we have our omnibuses in young adult this one will probably go up there. I hope the library binding is as sturdy as it looks...we shall see. If you want to add some shorter stories or collections, rather than the giant omnibuses or huge series, this is a good start. The story of this duck picturebook is ok in theory but falls flat in poetry. A lonely duck, his flock gone in a hurricane, sits alone in his lake playing a shiny kazoo. When winter comes, he flies away and finds a new family. The couplets and refrain are rhythmic, "And he played a sad song on his shiny kazoo: La ditty, da ditty, zu zu." but the narrative sections of the poetry don't scan well and the word choice is poor. "So the duck packed his things and gazed at the view. 'Good-bye, my dear lake. I'll truly miss you.'" But the pictures, oh the pictures are worth the story. They're watercolor and mixed media and the colors are marvelous. 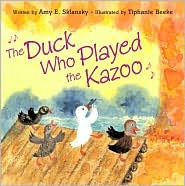 Soft, fading backgrounds, cheerful plump ducks, a shiny blue kazoo, and small humorous touches of anthropomorphism. The scenes with the other ducks are vibrant with reds and oranges, a deep green landscape as they fly, and a soft purple night. The text may be somewhat deficient, but the pictures are worth it! When you think Jane O'Connor, you think Fancy Nancy, right? Now there's nothing wrong with Fancy Nancy. In fact, if given a choice between the 'licious books, Disney Princesses, and Fancy Nancy, it's Fancy Nancy all the way for my fancy-loving little girls at the library. But Jane O'Connor has other things up her sleeve. You wouldn't know this from looking her up online - other than her info. with HarperCollins she doesn't seem to have an online presence at all. And really, does she need one? Buying Fancy Nancy is like buying milk - everybody does it, you don't need to advertise it. But she does, actually, write other things. Like the Eeek! Stories to make you Shriek easy reader series, which are the only really scary books I have for younger readers. 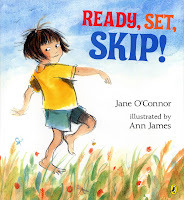 And....Ready, Set, Skip, one of my favorite action books. Simple rhymes show all the things a little girl can do...except skip. Finally, in a simple mother-daughter moment, she catches the secret....and they skip to school together. Simple? Yes. Irresistable? Of course. Try this in a storytime with all the kids seeing how many things they can do (including burp, whistle, hop, twirl, and skate). They're so cute and furry! Hopscotch, like most small rabbits (and children) knows exactly what he likes and what he doesn't like. And what he doesn't like most of all is having his ears scrubbed. But when his big bunny cousin Bobtail comes to spend the night, Hopscotch discovers there may be more to this washing-ears-business than he had thought. Verdict: This simple story with cute and well-executed illustrations will resonate with children starting to grow up and take responsibility for simple tasks. Plus, the pictures are quite funny! No angst, no irredeemable mistakes, and always someone powerful on the side of good. Horrible cover, but we can ignore that! The Chapel Hollow family has been growing increasingly twisted over the past decades. Laura, thought to be "wingless" or without great powers, thinks she has escaped, but is drawn back into the corrupt meshes of her family when she returns for her brother's wedding. But she does not return alone. Tom Renfield, janitor, drifter, and a man with strange abilities, may be the only person who can cleanse Chapel Hollow, return the family to its former strength and goodness, and help Laura accept her power. Verdict: So sad that this is out of print! 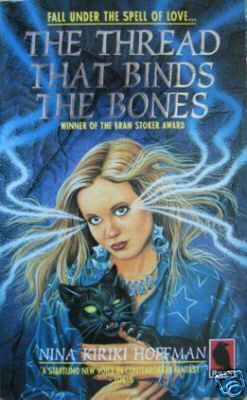 Worth digging up a used copy for your own delectation and that of any teens who will enjoy the mix of fantasy, family drama, romance, and powers. 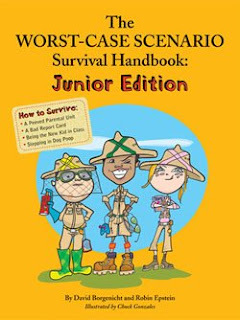 This should have a different subtitle - The Worst-Case Scenario Survival Handbook for Spoiled, Bratty, and Unimaginative Kids. The top worst-case scenario category is embarrassing events at school. Not dangerous, not life-threatening, not intellectual challenges, EMBARRASSING. Like falling down in the cafeteria or how to look cool when you don't know anybody. The next largest category would be how to make excuses when you've gotten yourself into trouble. In other words, how to con your parents and others in authority into thinking you're sorry when you're not. And then we have ways to exploit and manipulate younger siblings, how to increase your allowance (preferably without doing extra work) and a bonus section on how to survive outdoors. In addition to the blah content, the type and illustrations are all in black and orange (is there some secret correlation with Halloween?). I really enjoyed some of the other worst-case scenario handbooks, their wacky humor and improbable situations were fun. But I think the authors tried too hard to be "practical" and "humorous" at the same time. And is embarrassment at school really the worst thing that could ever happen to you? Verdict: Despite my own annoyance with this book, it probably would circulate well with elementary students - the middle school version has been popular with my middle school patrons. Reluctantly recommended. 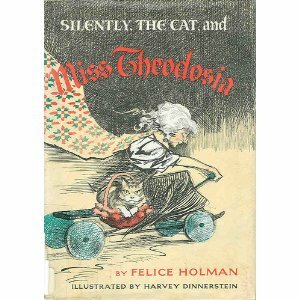 The town thinks Miss Theodosia is a recluse, spending all day hidden in her house with her cat, Silently. But in reality, Miss Theodosia is terribly, terribly busy. There are decisions to be made, afghans to knit, proverbs to learn. Only at night can she relax, when she takes out her Irish Mail and travels the roads and hills around the town with Silently. This is the story of how Miss Theodosia's proverbs come in handy and the exciting adventures she has on her nightly journeys. Verdict: Felice Holman fans will want to take the time to track down this out of print title, but it doesn't really fit into the modern picture book genre which is much more visually oriented with briefer text. A good gift for fans or that special child who will appreciate Holman's delicate sense of wonder. After hearing people mention this frequently as an old favorite on various blogs and in the library, I finally found a copy to see what all the fuss was about. On the surface, it's a very repetitive, simple story. 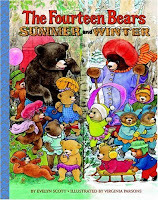 Fourteen bears, two parents and twelve children, live in various tree houses and go through seasonal activities. The illustrations are bright and slightly cartoonish. However, the appeal to children - and adults - is also easy to see. The backgrounds and details, especially the woodland creatures and plants, are beautifully drawn. The story is simple but not overly sweet or kidsy and the repetition is comforting. The story is classic in its simplicity and appeal and deserves to be remembered and reprinted. Verdict: I can see a market for this if it was ever brought back into print. I love polite society fantasies. Not necessarily set in the Regency or other historical period, but fantasy with all the trappings of fashion, the "season", and just that little bit of romance. 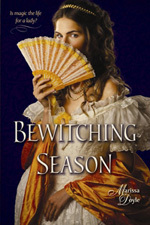 Unfortunately, despite all the good reviews I read, Bewitching Season just wasn't that....good. The characters' dialogue sounded too contemporary, the magical system was never explained, and the basic plot was cliched. Shy, socially inept, studious girl? check. Outgoing, social, slightly air-headed girl? check. Dazzlingly handsome young man who sees shy girl's true worth? check. Granted, these elements were given a bit of a twist by making the girls twins, as well as in the historical setting (immediately before Victoria's reign) but it still felt like Doyle had transferred a modern plot back in time. It wasn't clear exactly how the magic worked - at one point they were using spoken spells, at one point incancations requiring materials, and the villains used some kind of magical shield and pentacle. It was an ok read and I'll be looking for the sequel to find out what happens to Pen, but I'm not trading out my Patricia C. Wrede/Caroline Stevermer polite society fantasies yet. Verdict: The polite society fantasy is a particularly favorite genre of mine, but I haven't met any teens that appreciated it. An additional purchase if you have fans of this genre. This rhyming bedtime story has charming illustrations, but I felt that the rhymes were clunky. 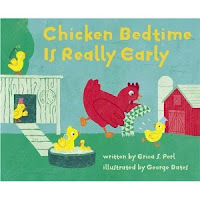 Various animals go through anthropomorphic or silly bedtime routines at different times throughout the night until morning arrives. There are plenty of bedtime stories and this one doesn't stand out enough to be a required purchase. Hmm. I'm not sure what I think about this. Some of the entries are in the best tradition of naughty-children-being-horribly-and-unbelievably-punished, like Angry Abby, who is eaten by an Awful Alligator. Or Lazy Lenore, "While out on the lake, she won't lift an oar. The boat springs a leak. Now who'll help Lenore?" But others, like Mischievous Martin and Doodling Daphne just continue on their way without consequences. The naughtinesses are odd mixtures of inappropriate or rowdy behavior, like the Terrible Twins, or just plain nastiness, like Fiendish Frankie and his Frisbee. I think I'd call this a sort of postmodern version of the traditional naughty children rhymes. There's no particular order or logic behind who gets punished and who doesn't. Sometimes the punishment matches the crime, sometimes the kids get away with their nasty behavior. But it is fun to read, the rhymes are well-written and have lots of kooky words to enjoy, such as bluster, flan, catastrophic and more. The illustrations are hilarious, with a mix of drawings, photos, and little speech bubbles. While my inner cataloger clamors for order and logic in the children's comeuppance, I think I'll let my inner child just enjoy the wacky story. Verdict: An additional purchase, as it's not really a good read-aloud for storytime. Add if you have parents and kids who like naughty children books. 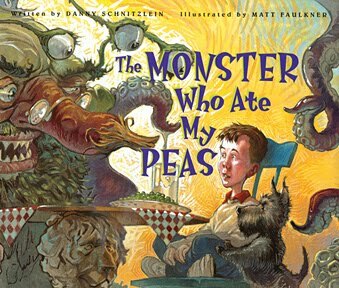 A little boy makes a bargain with a monster to get rid of his horrible peas....until he finally comes to his senses and realizes that some things are worse than vegetables. This story combines an oddly nasty moralistic message with deliciously gruesome illustrations a-la David Catrow. 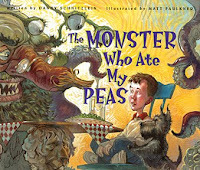 It's difficult to believe in the little boy's sudden conversion to pea-love, but the audience is unlikely to worry about the believability of the story when there's a monstrous vegetable-eating creation to groan over.